Set Savings of $47 $419 $466 if items purchased separately This 5-Pc. Kitchenette Set features super-sharp American-made cooking knives that deliver clean cuts and make prep work fast and easy. Complete with a tray that will safely store and protect the edges of your knives. Hang on a wall or store in a drawer. Set Savings of $48 $424 $472 if items purchased separately This 4-Pc. 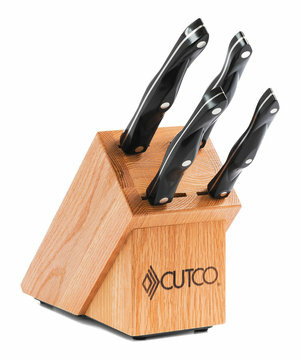 Studio Set features super-sharp American-made cooking knives that deliver clean cuts and make prep work fast and easy. 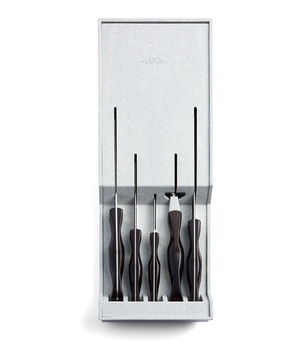 Complete with an oak block that will safely store and protect the edges of your knives. New! 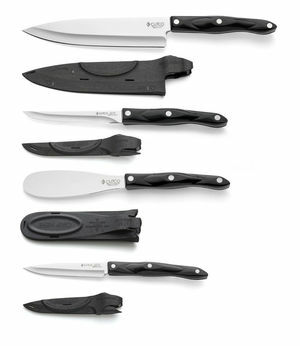 $299 This conveniently packaged knife and storage sheath set contains 3 of Cutco�s top everyday kitchen knives and is ideal for the person who wants multiple pieces they can safely store in a drawer. 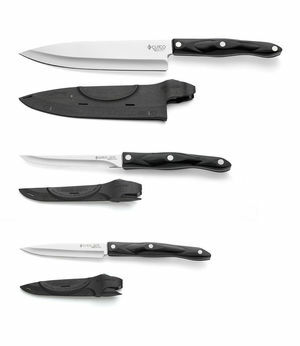 $379 This conveniently packaged knife and storage sheath set contains 4 of Cutco’s top everyday kitchen knives and is ideal for the person who wants multiple pieces they can safely store in a drawer.